Surpised, sister-in-law? 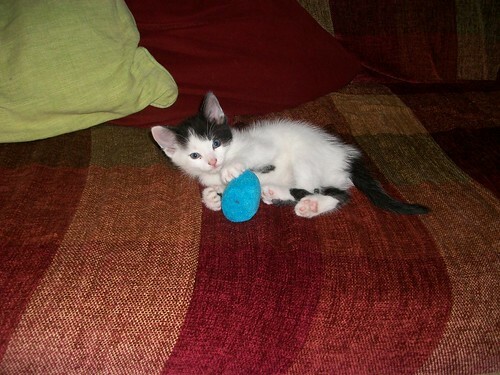 Dot, well, the kitten is two months old which is two in children years, think Hugh instead. They’re underwhelming when they’re bald newborns with no fur and their eyes haven’t opened. Pog, actually a she despite inappropriate name – how are you, your pogness? TM, so far so good. She’s terrified of the children, they’re keeping her in check. CAD, this from the woman who recently moved countries again with three small children. Ahem. I sense you won’t be subscribing to this http://www.urlesque.com/2009/09/08/a-day-without-cats-final-ban-list-for-9-9-09/ next year. 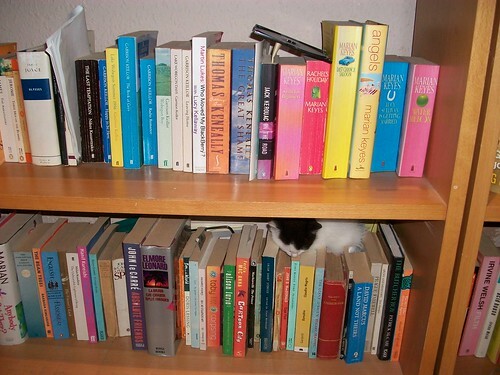 Bookshelf kitten!!! I’m melting here. I’m fine tks waffle. Busy as a busy thing but it doesn’t seem to keep me out of trouble! Hodge is the prettiest kitten I’ve ever seen! Alice, Pog, you are too kind. I think she will shortly be a cat and far less photogenic.